Spring 2017 Making Spaces Fundraiser will help create makerspaces at six local schools! You’re invited to a special fundraiser to help six local schools realize their dreams of creating makerspaces. A school makerspace is a place for hands-on making, learning, and sharing; for creating something out of nothing; and for learning technical and critical thinking skills. 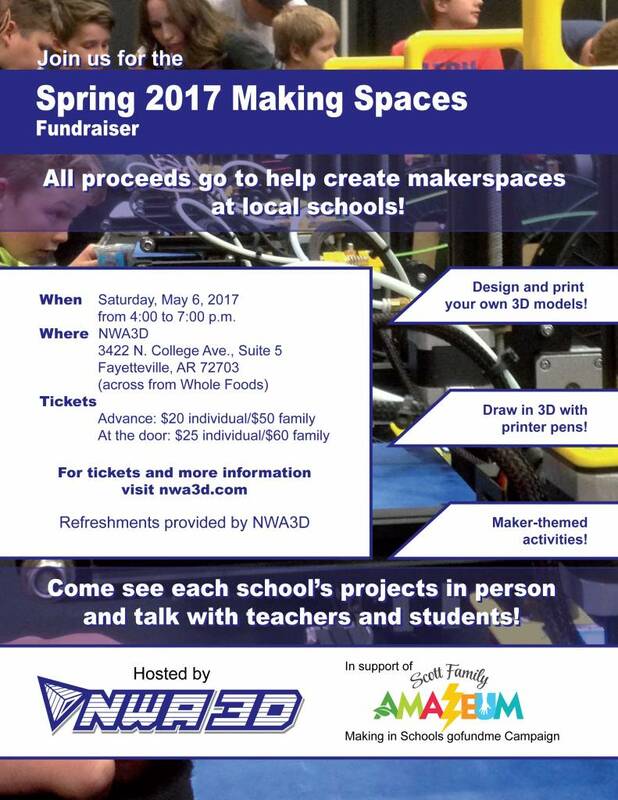 The Spring 2017 Making Spaces Fundraiser will be hosted by NWA3D at its Fayetteville facility. Attendees at this fun, family-friendly event will get to experiment with 3D design, 3D printing, 3D printer pens, and more. Proceeds from the event will be distributed to the GoFundMe crowdfunding campaigns for makerspaces at the participating schools. You’ll also have the option to donate to the school of your choice. Refreshments will be served. Buy tickets here! When: Saturday, May 6, 2017, from 4:00 to 7:00 p.m.
 Washington Junior High will have a booth at the fundraiser!  J.O. Kelly Middle School will have a booth at the fundraiser!  Arkansas Arts Academy will have a booth at the fundraiser!  The New School will have a booth at the fundraiser!  Old High Middle School will have a booth at the fundraiser! The Making Spaces Fundraiser is a partnership between The Scott Family Amazeum and NWA3D. Sign up for our FREE Monthly Q&A Webinar! Is your 3D printed project food safe?